The Reptilians are one of the races of visiting alien pervasive within the UFO culture, along with Greys and Nordics. This book covers a lot of that lore, and looks in detail at the essential Serpent mythology in religion. 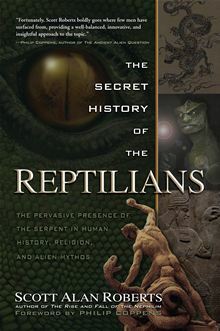 Where some books presenting this kind of overview might settle on the concept that the modern Reptilians are simply an extension of deeper undercurrent of mythology lying at the heart of our ancient cultural heritage Scott Alan Roberts leaves the door open for a chink of UFO light to peek through the darkness. He also follows along the many threads of Serpent lineage that pervade another niche of alternative knowledge authorship - that of Bloodlines. It's the sort of score-settling one might expect to read in an autobiography. I strongly suspect that much of the research and received opinion in the book has been derived from the Internet. I will shortly demonstrate that clearly in the case of the author's scorching and erroneous critique of the work of the late Zecharia Sitchin. Is that a problem in itself - that shift away from books and journals to online content as research material for books? Not necessarily, as long as one checks back to the original sources as well, especially when levelling criticism. If Scott Alan Roberts had paid more attention to the foreword of his own book, then he would have realised that he was wrong to link Sitchin so closely to the Reptilian Theory. Sitchin's Anunnaki are very much like humans; enough to allegedly allow natural interbreeding (if one entertains his interpretations of what the ancient Mesopotamian myths meant). There are quite reasonable critiques of Sitchin's work reproduced in this book, I should add. It's just that they don't apply to Reptilians. The way such arguments work is to look closely at the interpretation of key words in ancient texts. There's a certain amount of extrapolation involved, with words taken to their extreme meaning to fit editorial context. This is a methodology that the author is savvy enough to recognise in the hands of writers like Sitchin, and generations of scriptural editors/translators who worked over ancient texts as they slowly evolved from one transliteration to the next. Mr Roberts' own hypotheses run the same risks, of course, although my own knowledge of philology is not adequate enough to present a cogent analysis of his intriguing ideas. But it seems to me that he leans into the key words in much the same way. He brightens when describing the work of Laurence Gardner; especially the more obscure writings about the Merovingian lines (pp173-4). To amass further support, Mr Roberts also reviews some of the beliefs of various obscure Christian sects, many apocryphal texts, as well as the late 19th Century esoteric literature apparently so beloved of the Nazis. In the end, this eloquent and actually quite finely considered book fails to reach a strong conclusion. Perhaps that is wise, in keeping with the author's propensity for doubt. The narrative seems aimed at people of faith whom themselves entertain doubts, much like the author in his youth perhaps. The winding road he has mapped out in this book suffers from a large number of pot-holes (beyond the cavernous own-goal previously discussed) in the form of proper name typos: Hilter for Hitler; Karl Jung; Elil for Enlil; YWHW randomly interspersed with YHWH, Sumar for Sumer, Cletic for Celtic, and so on. My favourite typo was the delightfully nefarious 'encoded massages on the tombstone' (p185), although "...and - viola! - we have religion" (p122) came a very close second. These kinds of sloppy errors make it difficult to take his arguments as seriously as they may actually deserve. The closing section of the book takes on David Icke - a much bigger fish these days than the late, softly-spoken Zecharia Sitchin. I will leave it to Icke's fans (Ickites?) to pick apart that particular nest of vipers. Subtitled: "The Pervasive Presence of the Serpent in Human History, Religion, and Alien Mythos"